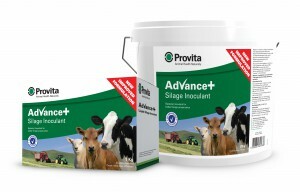 Advance+is a unique formulation on the UK market. It combines lactic and acetic acid strains at a guaranteed rate of 1.2 million cfu per g of forage. The strains work together allowing a rapid lactic acid fermentation which reduces dry matter losses by an average 41% followed by conversion of some lactic acid into acetic acid which extends stability by 3.6 days. Forages treated with this product will have improved stability compared to standard lactic acid products. Advance+ can therefore be used in forages of all levels of dry matter, it has produced positive results in EU efficacy trails in dry matters from 24% to 69%. In these trials Advance+ has been tested on Grass, Red Clover, Alfalfa, Wholecrop Maize and Corn Cob Mix, it can therefore be used in a wide range of crops including grass, wholecrop and maize. All three Advance+ strains are approved by the EU.